A research team spearheaded by Professor Dietmar Müller from the University’s School of Geosciences used high performance computing code to investigate the cause of the uplift which created the mountain range. The team found the answer in the mountains’ unusually strong gravity field. “The gravity field led us to suspect the region might be pushed up from below so we started looking at the underlying mantle: the layer of rock between the Earth’s core and its crust,” said Professor Müller. 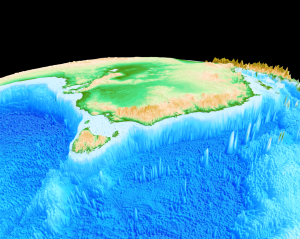 The team found the mantle under Australia’s east coast has been uplifted twice. The first occurred during the Early Cretaceous Period, when Australia was part of Gondwanaland. Over earth’s lifespan or ‘geological time’ the largely solid mantle has continuously been stirred by old, cold tectonic plate sections sinking into the deep mantle, under another plate. This process, called subduction, was occurring during the Early Cretaceous Period. The next 50 million years was a time of relative inactivity. Professor Müller said the two-phase uplift suggested by supercomputer models is well-supported by geological features from rivers in the Snow Mountains, where river incision occurred in two distinct phases. A new interactive globe is now available on the GPlates Web Portal that allows you to view dynamic topography through time of a geodynamic model that was used in the research.